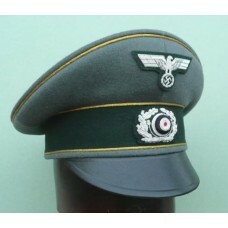 Pelzmützen for all Army & Waffen-SS ranks. 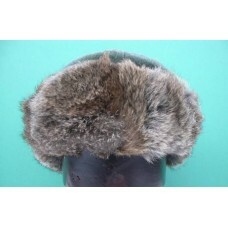 Field grey felted wool with rabbit fur flaps & qu..
Army Admin. 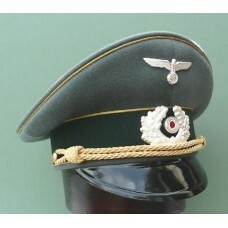 Generals Schirmmutze with tricot top, 2 rows of gilt wire piping & 1 of admin. 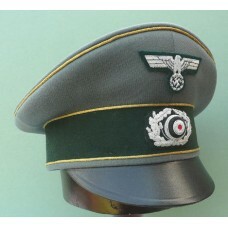 green..
Army Artillery EM & NCO Peaked Cap. 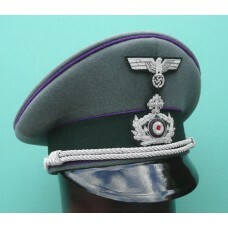 Army Artillery EM & NCO peaked cap with field grey felted wool top & red piping. 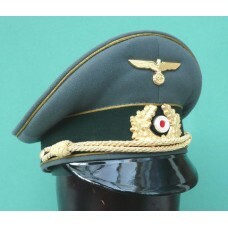 Black japan..
Army Officers peaked cap with tricot top, red piping & bottle green band, complete with hand emb..
Army Cavalry Officers Schirmmutze with 'doe skin' top & golden yellow piping. 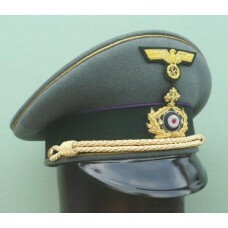 Hand embroidered w..
Army Cavalry Officer Schirmmutze with tricot top, golden yellow piping, bottle green cap band, alumi..
Army Chaplain peak cap with 'Doeskin' top & violet piping. 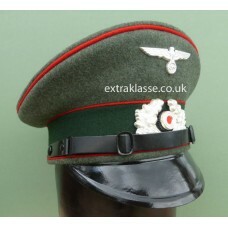 Complete with hand embroidered wreath..
Army Feldgendarmerie Officer Schirmmütze. 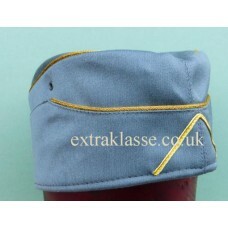 'Doe skin' top with Orange piping, bottle green cap band. 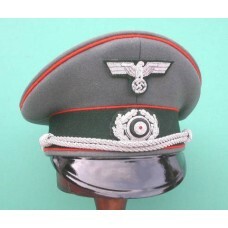 ..
Army Field Bishop Peaked Cap. 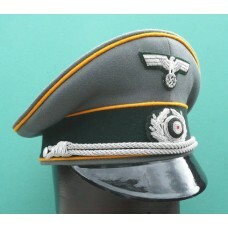 Army Field Bishop peaked cap. 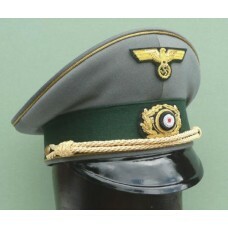 Grey 'doeskin' top with gilt piping on crown & lower cap band, vio..
Army General M38 Feldmutze, grey tricot with gold piping & chevron, synthetic silk lining with m..
Army General Staff Officers Schirmmutze, with grey 'doe skin' top, Carmine red piping & bottle g..
'Doeskin' top with gilt wire piping & bottle green band. 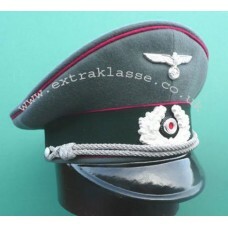 Unlike the Generals Schirmmutze the Old..
Army Generals crusher cap with tricot top, gilt wire piping & bottle green band. 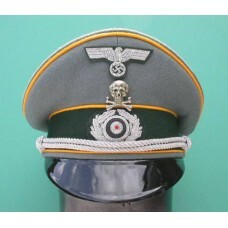 Unlike the Gene..
Army Generals Schirmmutze with tricot top, 3 rows of gilt wire piping, gilt metal eagle & wreath..
Army Generals Schirmmutze with 'doeskin 'top, gold piping, buttons & chin cord. 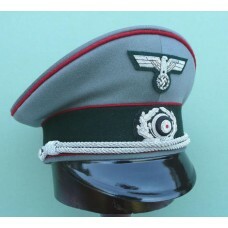 Complete with si..